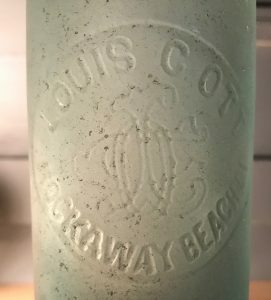 Louis C. Ott, Rockaway Beach, L.I. Ott’s hotel business appears to have been closely tied if not one and the same with the liquor and beer trade. The first mention of Ott that I can find is as a liquor tax certificate holder with the town of Hempstead. (Note that at the time Rockaway Beach was under the Jurisdiction of Hempstead and not yet a part of NYC.) He was listed with the classification “hotel”and located in Rockaway Beach, but no address was given. His certificate was paid up through September 4, 1890, which leads me to believe the business started at least a year or two earlier, sometime in the 1880’s. Whether Ott’s relationship with the Fallert Brewery dated back to his 1890 liquor tax certificate is not clear, but by 1899, it appears that the two entities had a falling out. On April 26, 1899, the Brooklyn Daily Eagle announced a judgement against Ott in favor of the Joseph Fallert Brewing Company for $7,308.40. Supervisor Louis C. Ott will shortly open the hotel corner of Eldert Avenue and the Boulevard, formerly conducted by Assemblyman Honeck. 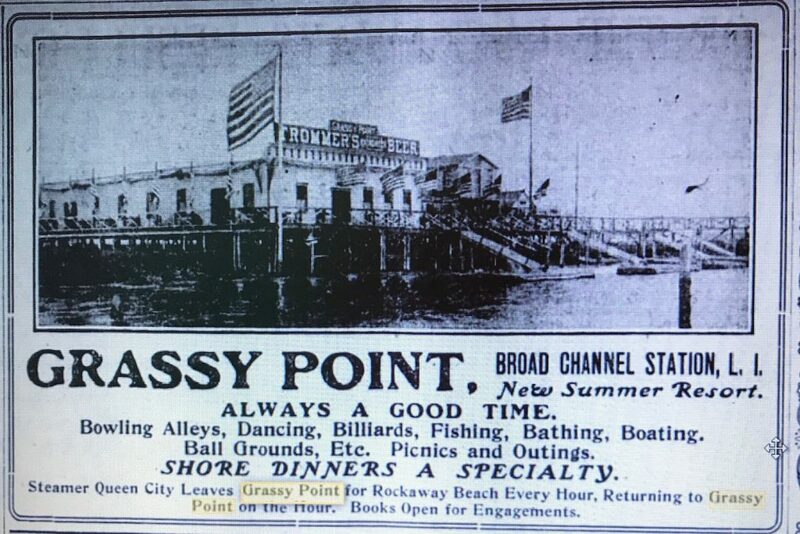 Around 1904 Ott’s listed location changed again and he was named in various newspaper articles as the proprietor of the Grassy Point Hotel located at Broad Channel on the Jamaica Bay trestle. Both the 1904 Trow Business Directory and the 1910 census records listed him at this location. In fact, The August 16, 1911 issue of the Brooklyn Daily Eagle reported that he spent his 57th birthday there. Louis C. Ott, former Assemblyman from the Sixteenth District of Brooklyn celebrated the fifty-seventh anniversary of his birth at a family dinner at the hotel of which he is proprietor, the Grassy Point, on Broad Channel on the evening of Tuesday last. The table was placed lengthwise of the long dining room, covers being laid for twenty-four. The decorations were asters and gladioli, a huge horseshoe of asters being placed on a table just back of the host, a gift from friends and sent with many wishes for good fortune. More than just a hotel, Grassy Point was a resort that included a restaurant, dancing, bowling alleys, billiards, a fishing station, bathing, boating and ball fields. A photograph contained within a 1908 advertisement left no doubt that by then, Ott had switched his allegiance from Joseph Fallert to Trommer’s. Ott apparently operated the Grassy Point Hotel through at least the mid-teens. Ott was listed with a Broad Channel Hotel in the 1910 NYC Telephone Directory but not in the 1914 edition. By 1920, census records showed him widowed and living on Long Island in the Valley Stream/Lynbrook area with a son-in-law. He died while living on Long Island in July, 1924. The Grassy Point Hotel remained in operation until it was destroyed by fire in January 1939. According to the January 5, 1939 issue of the Brooklyn Daily Eagle, the damage had been extensive enough to require rebuilding of the structure. At the time of the fire, the operation consisted of only a restaurant and grill. No rooms were rented. Pvts. Harry and Walter Ott, sons of Louis C. Ott of Mineola Ave., Valley Stream, L.I., have both been wounded. They were drafted in 1917 and trained at Camp Upton before departing for France. Walter is 22 years old and Pvt. Harry is 25. Both were engaged as chauffeurs prior to their entrance into the service. Walter, who is a member of Co. G 308th Inf. was wounded on August 17th. Just when Harry was hurt is not known. He wrote his father a note from a hospital ship stating that he had been injured and that he was on his way to London. A third brother, Sgt. Andrew Ott, is stationed at Camp Sevier in South Carolina, giving instruction on gas masks. He too, was drafted in 1917, sent to Camp Upton, where he received his sergeant’s chevrons, and finally to France. There he was gassed and after three months of continual trench duty ordered to return to America. He was a member of Company D, 305th Inf. He is 27 years old and was formerly a silversmith, employed by the Gotham Company in Manhattan. A fourth brother, Robert Van Wyck Ott, is eligible for the new draft and is expecting his call momentarily. The bottle I found is a champagne style beer with an applied blob top. The slug plate refers to Rockaway Beach, Long Island. 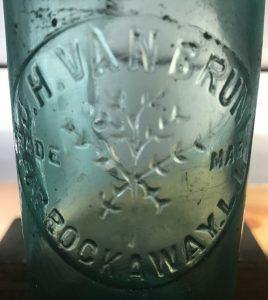 This would indicate it was made in 1898 (the year Rockaway Beach became part of NYC) or earlier and most likely contained the Joseph Fallert brand. Census records from 1900 through 1920 reveal that John Kessler immigrated to the United States from Germany in 1880 and worked as a salesman. Sometime after 1900 he started operating a hotel located somewhere on or near Woodmere Bay. The 1910 census lists his address as “out in Woodmere Bay”. He passed away sometime around 1914 and his wife Margaret continued to run the business for several more years. 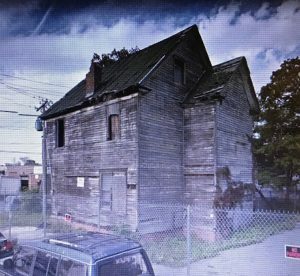 In the 1920 census Margaret is listed as a widow living with her daughter on West Broadway in Hewlett and the family is no longer involved in the business. 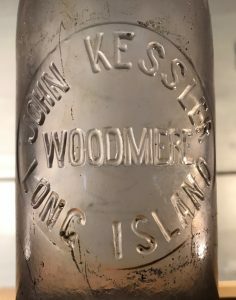 John Kessler, Hotel, Woodmere Bay south of Woodmere Dock, is listed as a liquor tax certificate holder for the years ending September 30, 1911 and September 30, 1912. In the years ending September 30, 1914 and 1915, Margaret not John is listed as the certificate holder. I’ve found that many local hotel owners in this era were liquor tax certificate holders and bottled their own beverages. I found a champagne style beer bottle with a tooled blob finish that fits the early 1900’s time period. I haven’t seen this one on the Internet adding to the evidence that this was a small local business. The A stands for Anthony (Anton) Wolff. Wolff is first listed in the 1880 NYC Directory as a maltster with a home address of 330 East 47th Street. 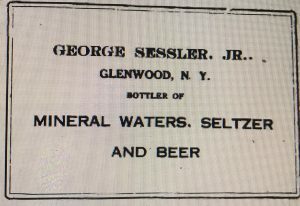 In the 1884 directory he’s listed as beer with a home address of 226 East 56th Street. Then from 1886 through 1912 he’s listed in various NYC directories as a bottler (or sometimes beer) on East 55th Street. He listed several addresses over the years, all on 55th Street between 2nd and 3rd Avenue, primarily 204 East 55th St.
To All Whom it May Concern: I Anthony Wolff doing business and trading as the Central Bottling Co, certify that I am engaged in bottling and selling lager beer, ale and porter and other beverages, and use and have the sole right to use my name, marks and devices branded, stamped, etched, blown or otherwise produced upon my bottles and boxes, a description of which distinguishing names and marks is as follows: Glass bottles on which is “Central Bottling Co” and “A Wolff”; other bottles with “Central Bottling Co”; other bottles “A Wolff”. Boxes on which is “Central Bottling Co” and “A Wolff”. CENTRAL BOTTLING CO. By A WOLFF. The business is listed in the Annual Report of Factory Inspectors of the State of New York in 1896 and 1898. In 1898 they listed 6 male employees. 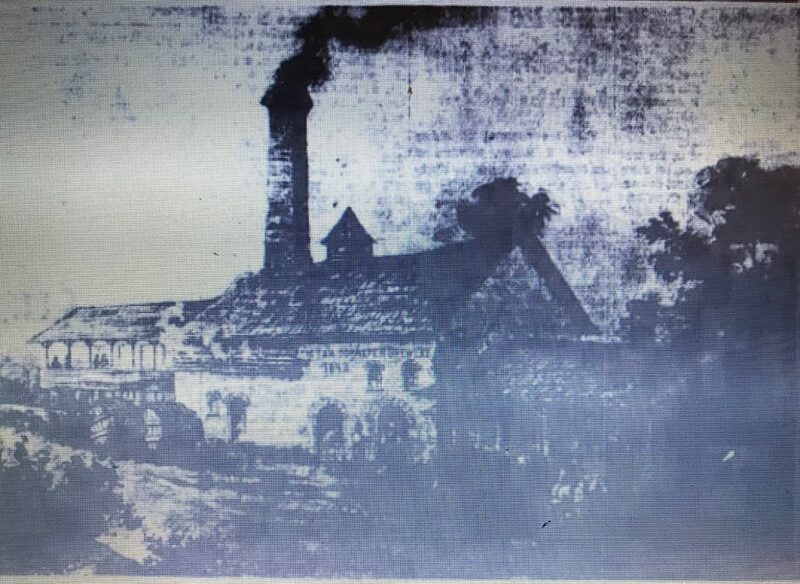 Several New York State newspapers covered a fire that included Wolff’s plant that occurred on August 25th, 1898. The explosion of a large ammonia tank used in the making of artificial ice set fire at an early hour this morning to Jacob Hoffman’s Crescent Brewery, a 5-story brick structure at 206 and 208 East Fifty-fifth Street. The flames spread with marvelous rapidity and the Central Bottling Company’s plant, of which A. Wolff is the proprietor, at 202 East Fifty-fifth Street soon caught fire. 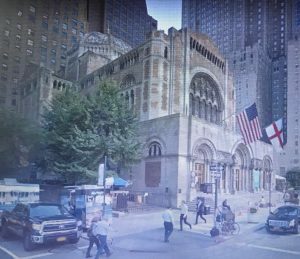 Within a very short time the entire block surrounded by Third Avenue, Fifty-fourth and Fifty-fifth streets were doomed. The surrounding tenements, all filled with sleeping people, next ignited and the bewildered tenants began to pour out into the streets by the hundreds. Alarm after alarm was turned in by the police, and by the early arrivals of the firemen, until four alarms had sounded and 18 engines and five hook and ladder trucks were on the scene. As a precaution several ambulances were called from Bellevue and other hospitals. Many thrilling rescues of frightened men, women and children were made by the firemen. Wolff’s business must have survived the fire because he remained at 55th Street through 1912. In 1912 the American Bottler reported that Wolff resigned his membership in the organization that year. He’s not listed in the 1914 NYC Copartnership and Corporation Directory, so I have to think the business ended in 1912. In the NYC Copartnership and Corporation Directories between 1905 and 1914 there is also a Central Bottling Co listed at 617 11th Avenue (it’s listed under Central). In the same directories Wolf is listed under Wolff as “Wolff A., Central Bottling Co. (RTN) (Anton W. Wolff).” Based on this there doesn’t appear to be a connection. The bottle I found is a champagne style (12 oz) with a tooled blob finish. It fits within the 1886 to 1912 time frame of the business. 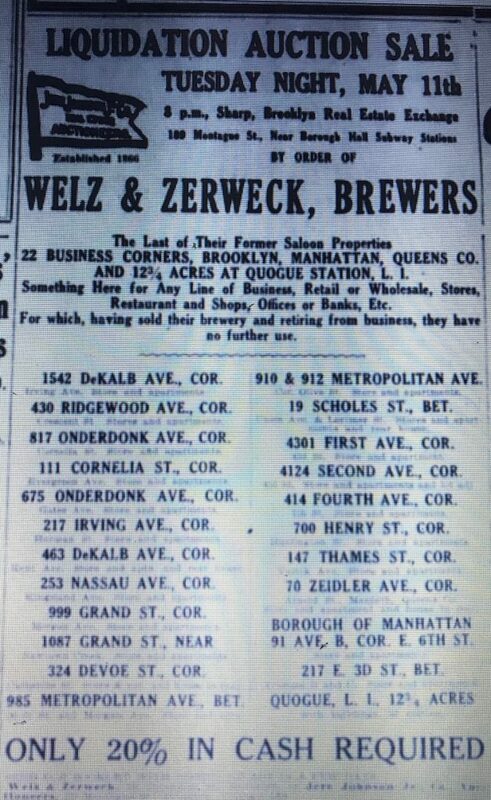 Welz & Zerweck High Ground Brewery, Brooklyn, N.Y.
Welz and Zerweck traces its roots to John Welz who was listed as early as 1858 in the Brooklyn City Directories as a brewer located at 132 Scholes. The company was featured in the “Illustrated History of Greater Ridgewood” published in 1906. The feature included information on it’s early history. The original brewery was established in 1859 by the late John Welz. The brewery was first established in Scholes Street and Graham Avenue, in the old “Dutchtown” section of Williamsburg. Two years later it was moved to the building on Myrtle and Wycoff Avenues. In 1897, the brewery was made a limited corporation with John Welz, president; Chas C.D. Zerweck, vice-president, and Harry Roth, secretary and treasurer. These three officers also comprise the Board of Directors and are the owners of all the company stock. It was called the Welz Brewery until 1883 when Charles C.D. Zerweck and John Welz’s son, also named John, took over the business. Zerweck, a German immigrant, had joined the Welz Brewery in 1878. The business was first listed in the Brooklyn directories as Welz and Zerweck in 1884. Well and Zerweck was listed in the 1890 Lains Business Directory of Brooklyn and the Trow Business Directory for the Borough of Brooklyn in 1899, 1903 and 1907 (the only years I could find). It was also listed in the “Copartnership and Corporation Directory of the Boroughs of Brooklyn and Queens 1913-1914; John Welz President, Charles Zerweck VP, Henry Roth Treasurer, Capital $1,500,000. Certainly a closely held company, the 1913 -1914 officers were the same ones that were listed in 1897 when the corporation was formed. The address was always listed as Myrtle, corner of Wycoff, or sometimes 1562 Myrtle. The feature in the “Illustrated History of Ridgewood” goes on to talk a little bit about the growth of the company in both size and volume of business. If the old adage “tall oaks from little acorns grow” was ever appropriately applied, it is so applied to the Welz & Zerweck Brewery. By turning out the best beer that the concern could possibly give to consumers the establishment grew, and from an output of 5,000 barrels a year in the beginning, the concern is brewing and selling more than 300,000 barrels per year, and the new additions that have been made allow a capacity of 500,000. The entire plant and buildings, which include ice plant, brewery, bottling department, shipping department and offices, cover over four acres of ground. The beer is sold in every part of Long Island and the Greater City, and is shipped to distant parts, such as the Southern States and Puerto Rico. Perhaps the best illustration of Welz and Zerweck’s growth from the early 1860’s until the turn of the century are two photographs that attended the feature. The first and largest showed the plant as it existed when the feature was written in 1906. The second, inserted into the lower left hand corner shows the original 1862 building at the Myrtle and Wycoff location. 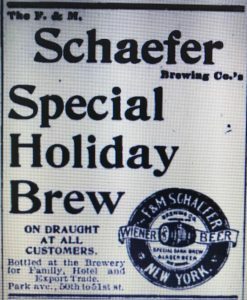 I haven’t seen many newspaper advertisements for their beers, but one in the February 15, 1912 issue of the“Forest Parkway Leader Observer” listed a wide range of products including: Gabrinus Brau, Pilsner Beer, Export Beer, Standard Beer and Sparkling Ale and made it a point that“our beers and ales are brewery bottled only.” They were were all $1.00 per case. Welz and Zerwick apparently maintained branches or maybe sales outlets on Long Island as well. An advertisement for one of them in Sag Harbor was printed in the November 26, 1910 issue of the “Sag Harbor Corrector.” The advertisement showed that prices outside of Brooklyn were higher by 20 to 50 percent ($1.20 to $1.50 vs $1.00). 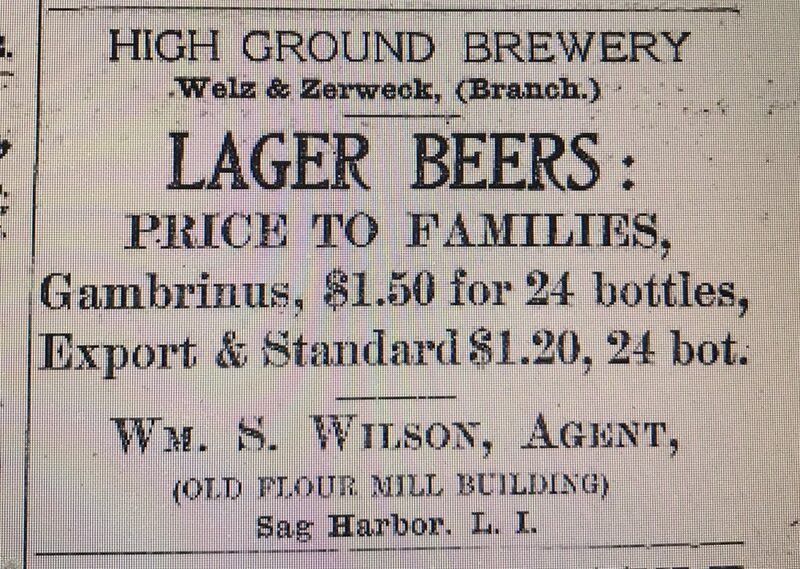 It appears that the business continued to operate under the Welz & Zerweck name during the early stages of Prohibition. 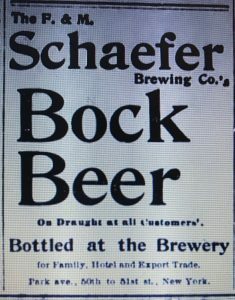 A June 21, 1921 article in the “Beverage Journal” provided a review of brewery activities (during prohibition) and stated that Welz and Zerweck was making cereal beverages. They were still listed in the Copartnership and Corporation Directory of the Borough of Brooklyn and Queens in 1922, with both Welz and Zerweck as directors, but by 1925 the business had shut down. According to the May 7, 1925 issue of the Brooklyn Daily Eagle, the brewery complex, located at Myrtle and Wycoff was demolished to make way for a new theater and office complex. The Welz and Zerweck Brewery, one of the oldest landmarks of the Ridgewood section, occupying the triangle formed by Wycoff Ave., Myrtle Ave. and Madison Street., is shortly to be razed to give way to the construction of a modern theater and office building with a street row of stores it was learned today. 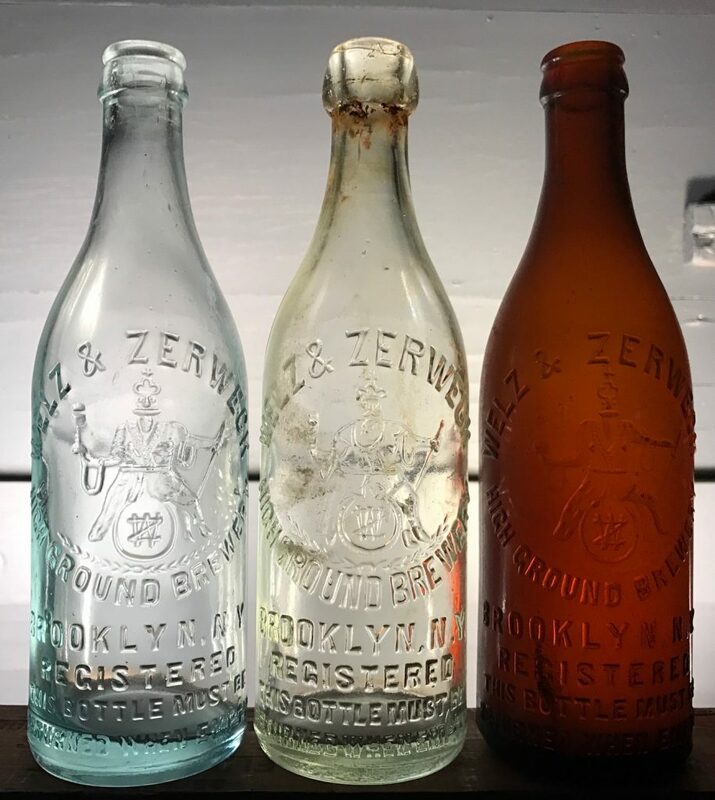 The Welz and Zerweck plant has stood on its present site for more than half a century, and until prohibition, was one of the most flourishing Brooklyn breweries. In passing, however, it has been more fortunate than many other breweries. A subway was built through Wycoff Ave. with a station at Myrtle Ave., and a business center for a population of 100,000 has sprung up around the site, making the property of even greater value than ever during the pre-Volstead days. It is understood that the new theater building will be from five to eight stories high and that work on it will commence in a month or so. The last of their former saloon properties…for which, having sold their brewery and retiring from business, they have no further use. Finally it appears that the the Welz and Zerweck brands were absorbed by Liebmann’s. 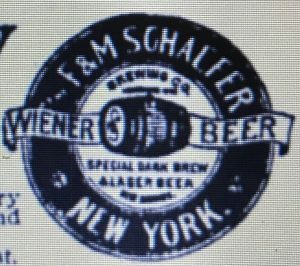 According to a March 29, 1933 article in the Brooklyn Daily Eagle, Liebmann’s didn’t plan on continuing with them when National Prohibition ended. 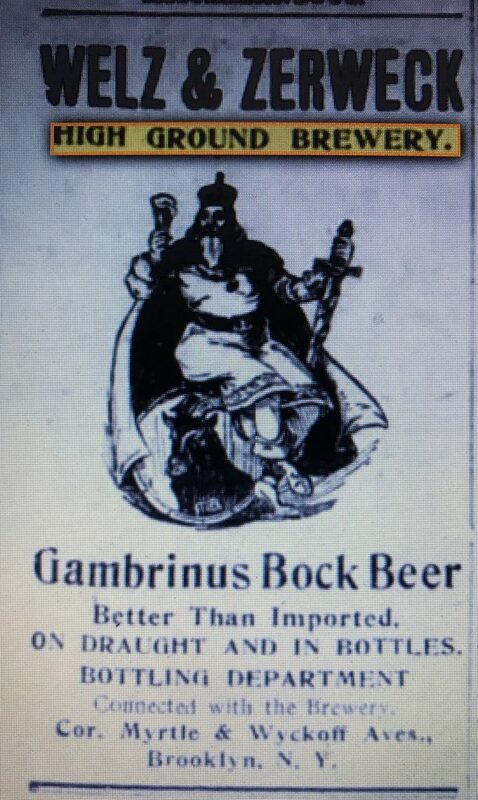 Before Prohibition put a snag in the beer business Liebmann’s has absorbed many famous brands of beer and breweries. 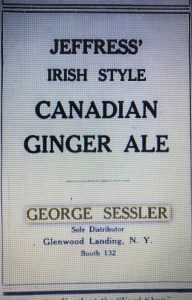 They were Peter Doelger’s, Welz & Zerweck’s, George Ehret’s, Obermeyer & Liebmann’s plaza brew, Beadelston & Woerz and the Krumenaker bottling works – and some 30 other brands. 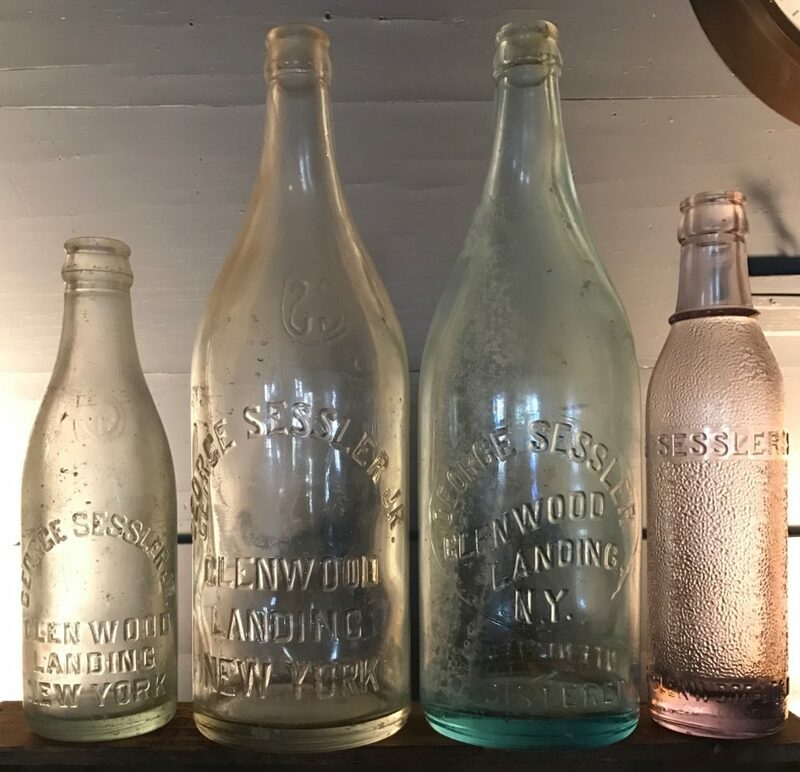 With the possible exception of Peter Doelger’s, all of them will remain absorbed, and they will reappear – are now being bottled – as Liebmann’s. I found one bottle with a tooled blob finish, several aqua tooled crowns and one brown tooled crown. I’ve also found a machine made example that exhibits a standard slug plate. J. H. VanBrunt, Far Rockaway, L. I. The J stands for James H VanBrunt. 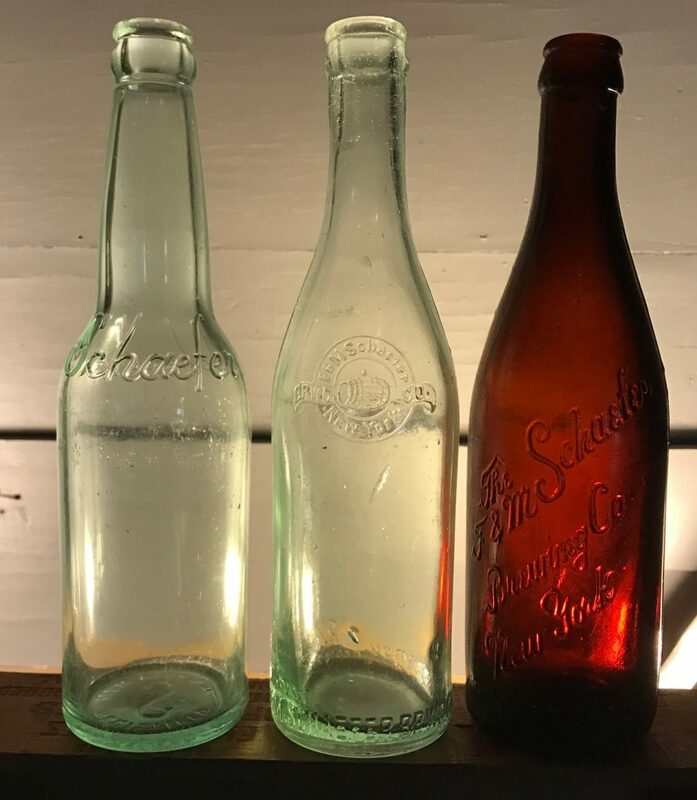 One year later, the October 1905 issue of American Bottler reported that VanBrunt’s bottling factory sustained $1,000 worth of damage in a fire but he remained in business for at least the next 15 years. 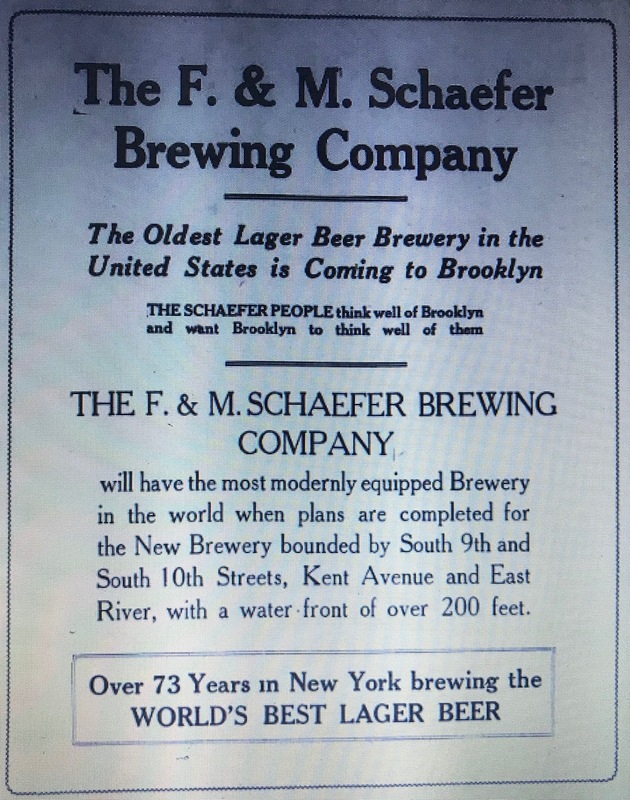 The business was listed in the Trow Business Directory of the Borough of Queens 1907, 1908-9 and 1912 as a bottler of lager beer Carlton Ave c Guy. This location was identical to the former address of HC Muller. In addition, the ensignia on his slug plate is remarkably similar if not the same (a vine or small tree). At some point he became associated with the Otto Huber Brewery, probably as a local Far Rockaway bottler. The NYC Telephone Directories for Brooklyn and Queens between 1914 and 1920 listed him as “Huber’s Beer,” with a Carlton Avenue address. As early as 1910, census records listed his occupation as an agent in the beer bottling industry. He’s also listed as a certificate holder in the “Annual Report of the Commissioner of Excise” for 1914, 1915, 1916 and 1919. He’s no longer listed in the 1925 directory so I suspect he was a victim of National Prohibition. Carlton has been renamed Nameoke Avenue and Guy has been renamed Augustina Avenue. 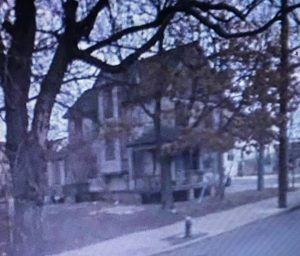 1910 census records indicate that VanBrunt’s family and a boarder all lived on Guy Street, probably at the same location as the business. This leads me to believe that an old frame building on the northwest corner of Guy (now Augustina) once accommodated the business as well as the family. The bottle I found is a champagne style tooled crown (12 oz) that fits the early 1900’s time frame. I’ve seen blob top VanBrunt bottles on the Internet so I assume it’s not one of his initial productions. 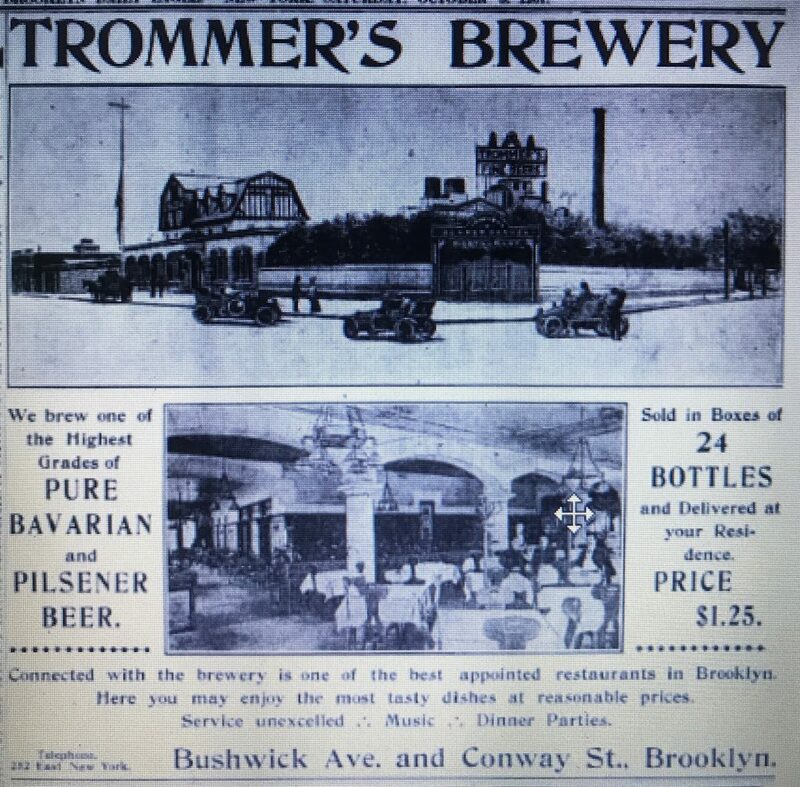 Trommer’s Evergreen Brewery, Brooklyn, N.Y.
John F. Trommer purchased the recently built plant of Stehlin and Breitkopf in 1896. Prior to that he served as William Ulmer’s brewmaster. After his death in1897, his son George took over and grew the business. 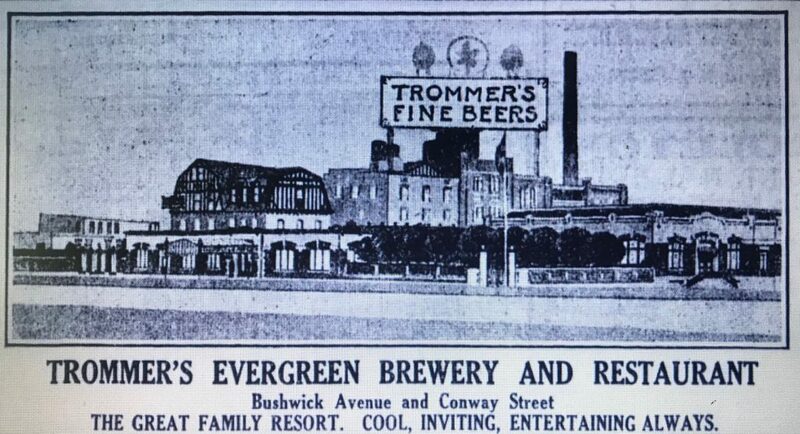 Albany N.Y., August 2 – The John F Trommer Evergreen Brewery Company of Brooklyn was incorporated today with the secretary of state with capital stock of $175,000. The directors are George F Trommer and Caroline Trommer of Brooklyn, William G Ringler, Lorenz Zeller and Edward Michling of New York City. George Trommer continued to be listed as President and Caroline Trommer as Treasurer in the “Copartnership and Corporation Directory” of the Boroughs of Brooklyn and Queens 1913-1914. They were one of just a few breweries to make an all-malt beer with 100% barley and wheat malt and hops (no other additives like corn, rice, cane sugar, etc.). The advertisement goes on to provide a colorful description of the complex (that now included bowling alleys) and the beer it served. It can accommodate and entertain 4,000 people at one time. The entire property consists of 200,000 square feet. The main ballroom accommodates 1,000 couples. The Gardens surrounding the main building are set with numerous maple trees and hedges of California privet, which afford shade and country atmosphere to one of the prettiest “summer spots” in Greater New York. It is the finest park of the kind in the City; illuminated at night by countless colored lanterns and incandescent lights. Trommers has been for years and is, the rendezvous for automobilists for the hasty snack and full course dinner. The restaurant is completely equipped for the entertainment of large parties and its cuisine and service is unsurpassed. The Bowling Alleys in the main building are open for dates during the coming season. Fine instrumental music every evening by Fred A Reese’s Instrumental Band. Vocal entertainment by male singers every evening and Sunday afternoon and evening. The finest Pure Malt Beer, produced from the highest grades of barley malt, choicest growths of imported Saazer hops and German yeast exclusively, strictly made according to the German (Muenchner) brewing method and fully matured, representing the highest type of a “Pure Malt-Real Doppel-Lager Beer.” Our Augustiner Brau is a rich, nutritious, liquid food, contributing to the strength of body and nerves. “There is none better brewed and matured.” Try it and convince yourself. Send your order today, by mail or phone, we assure prompt delivery. Phone 1100 E.N.Y. 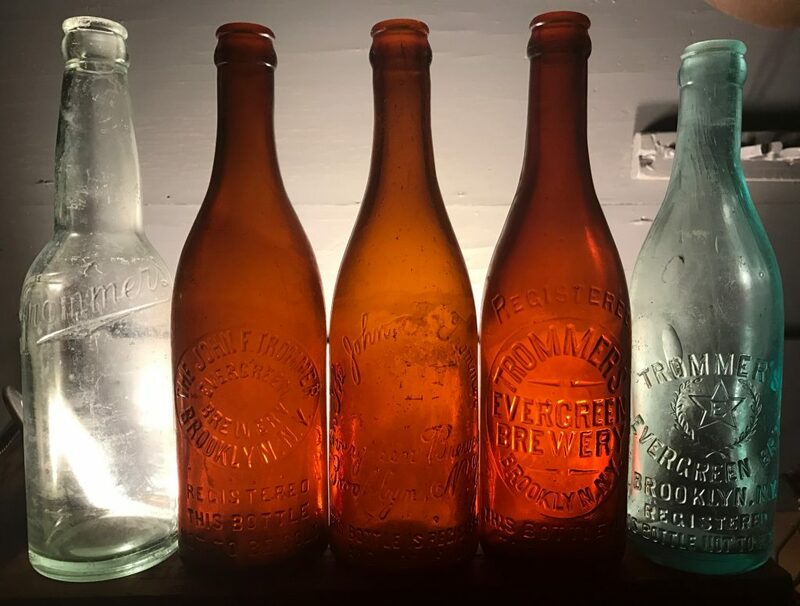 Trommer’s Bottled Beers – Our sanitary methods and care in bottling are second to none, and each bottle of our Pure Malt Beers has a reputation as to its Purity. We only brew one grade of beer, that which is made of the best Barley, Malt and choicest Saazar Hops exclusively. If you would spend a pleasant afternoon or evening come to Trommer’s. Take your wife and family. All cars – surface and elevated- transfer within one block of the door. During Prohibition they managed to expand the business by lending money and giving support to potential owners of hot dog restaurants as long as they’d feature Trommer’s White Label Near Beer. In 1930 they opened a second plant in Orange NJ and were extremely popular through much of the 1940’s. In 1949 a strike by brewery workers shut the NY breweries, including Trommers, down for 72 days. This allowed out of town brewers to get a foot old within NYC. Worse for Trommer’s was the strikers who had taken over the facility didn’t take care of their unique strain of yeast (required for fermentation) when they took over the plant and it died. Trommer’s had to begin a new strain of yeast and this radically changed the taste of their beer and NOT for the better. Trommers ultimately sold the Orange NJ plant to Liebmann’s (Rheingold) in 1950, and on February 9, 1951 the Brooklyn Daily Eagle reported that they sold the Brooklyn plant to Piel Brothers. The plant was closed in 1955 and Piels discontinued the label in 1962. There’s no sign of the Brooklyn plant today. I’ve found a total of 4 differently embossed Trommer bottles, all champagne style tooled crowns (12 oz). 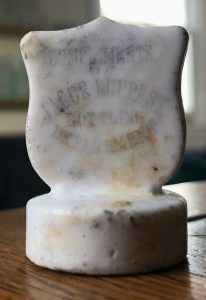 Two have the embossed name “John F Trommer (one script and one block letter slug plate) and the other two are embossed Trommer’s. I’ve seen blob top versions of all except for the script version on the Internet so I don’t think the name difference is any indication of age. 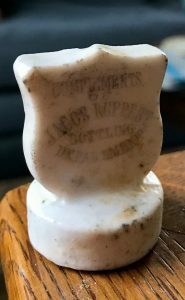 I’ve also found a machine made export bottle apparently made during Prohibition as it matches the bottle in a mid 1920’s advertisement for White Label. 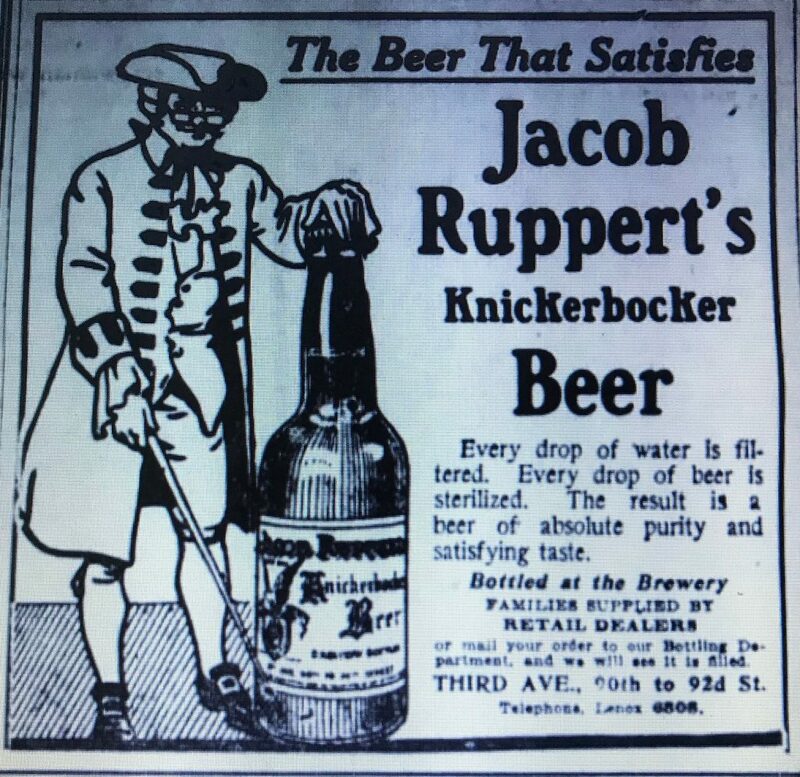 Jacob Ruppert was the son of Franz Ruppert, a NYC brewer who owned the Turtle Bay Brewery. 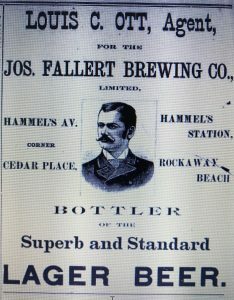 The 1865 NYC Directory lists Franz as a brewer at 192 E 45th St.
At the age of 10, Jacob began working in his father’s brewery before founding the Jacob Ruppert Brewing Company in 1867. His obituary, in May, 1915 provided an brief overview of the business up to that point. As a boy of ten years Mr. Ruppert began his career as a brewer in the employment of his father, Franz Ruppert, in this city. Later he started his own brewery in a building hardly fifty feet square, with no machinery. His establishment now has an annual capacity of 25,000,000 barrels. It contains four of the largest brew kettles ever built up to the time of its construction, each of which is composed of 200,000 pounds of copper and has a capacity of 25,000 gallons. In the 1869 NYC Directory, the Ruppert Brewery address is listed as Third Avenue, near 91st Street. Beyond 1870, the Brewery address is continuously listed as 1639 Third Avenue. 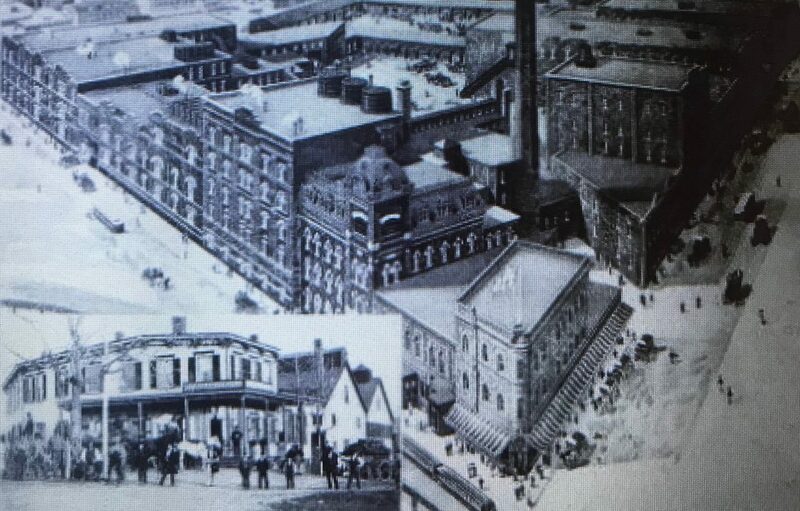 Ruppert’s brewery and George Ehret’s brewery were located adjacent to each other in Yorkville. By 1879, Ehret’s Hell Gate Brewery was the largest in the country and Ruppert was 7th largest. Ultimately their combined operations covered the four blocks from 90th to 94th Street between 2nd and 3rd Avenue. The Hell Gate Brewery shut down in 1929, before the end of Prohibition, and in 1935, it was purchased by the Ruppert Brewery. Ruppert’s son, Jacob Jr, was also in the business and by 1890 he was serving as the Brewery’s general manager. When Jacob Sr died in 1915 he took over the operation and ran it until his death in 1939. At the same time Jacob Jr was running the Brewery he became an owner of the NY Yankees and he was the president of the team when they acquired Babe Ruth, built Yankee Stadium and won their first championship. I found each of these labels and a fourth, Jacob Ruppert Metropolitan Beer, in a 1911 advertisement that provided pricing information. Their flagship beer was Knickerbocker. I’m not sure when they started using the name Knickerbocker but I haven’t seen an advertisement for Knickerbocker that I can date prior to the 1908 Label Registration date. 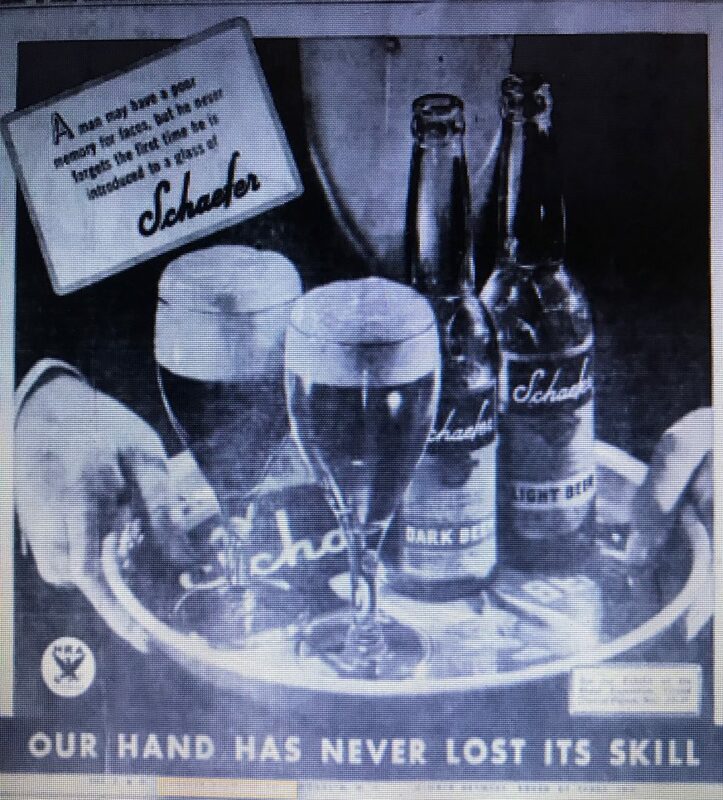 Their slogan was “The Beer That Satisfies.” Advertisements as early as the one below from October 1909 contained the slogan and they continued to use it up through the early 1930’s. To many of the fathers and Grandfathers of this present generation of New Yorkers the return of Knickerbocker Beer must be like the home coming of a genial friend, absent for a while from his native place, but never wholly forgotten…The rare unforgettable flavor is back again – all the zest and the sparkle, the tonic qualities and the wholesome delight that made the Knickerbocker beer of their youth the favorite of taste wise New Yorkers is yours today! According to “Beer in America, The Early Years”, during Prohibition, Ruppert failed to modernize his plant. This coupled with the increased competition by the national brewers put the Ruppert Brewery in a vulnerable position and the brewery ultimately closed in 1965. The Poughkeepsie Journal reported the closing in their January 2, 1966 issue. 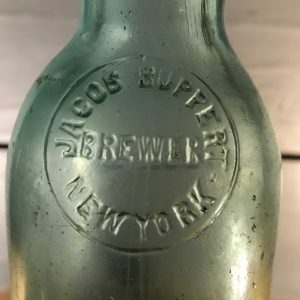 The Jacob Ruppert Brewery, a landmark in the Yorkville section of New York City ceased operations Friday. 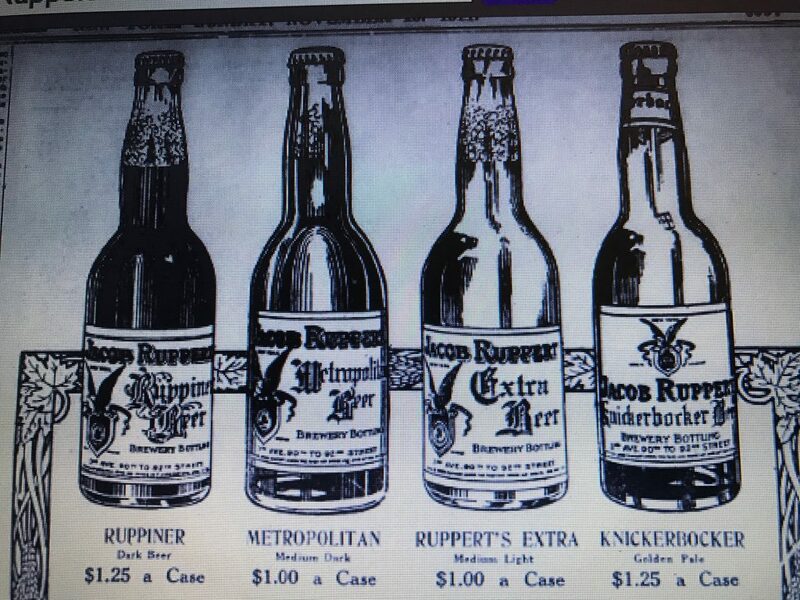 The Ruppert beer will continue to be brewed by Rheingold Breweries, Inc., which paid $12 million for the trademark, formula and equipment. Two years ago the brewery made known plans to build a plant near Carmel, Putnam County, but difficulty is assuring an adequate water supply, among other things, caused these plans to be abandoned. There’s no sign of the brewery complex today. The entire area from 90th Street to 94th Street between Second and Third Avenue consists entirely of modern high rise buildings. I’ve seen blob top finishes on the Internet but have never found one. H. Ressmeyer, 516 E 85th St., N.Y. The H stands for Henry Ressmeyer. Henry Ressmeyer was first listed with the business of Evers and Ressmeyer, located at 987 Park Avenue, in the 1901 NYC Copartnership and Corporation Directory. Both Henry Ressmeyer and Frederick Evers were also listed individually in the general directory that year as bottlers at 987 Park Avenue. The business remained listed that way through 1904. 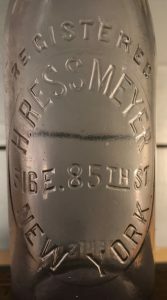 In 1906, Ressmeyer was listed individually as a bottler located at 234 East 84th Street. At this point the firm of Evers and Ressmeyer is no longer listed so it looks like Evers and Ressmeyer went their separate ways. By 1909 Ressmeyer had moved to 514-516 East 85th Street where he remained listed as a bottler through at least 1933. Census records in 1910 through 1930 called him a beer bottler that owned his own shop, so apparently it was not a large operation. He’s also listed in the Annual Report of the NYS Commission of Excise for Years Ending September 30, 1911 and 1913 @ 516 E 85th Street. It’s not clear when the business ended but I couldn’t find a listing for him in the 1940 census records. Today, 514 and 516 E 85th Street no longer exist. They have been replaced by a large apartment building at 510 E 85th St. 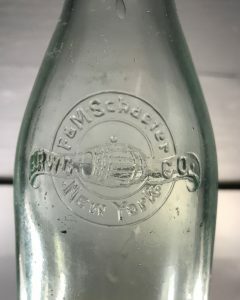 The bottle has the 516 E 85th Street address embossed on it dating it no earlier than 1908-1909 when the business moved to that location. It’s a champagne style beer with a tooled blob finish so it wasn’t manufactured too long after the move.